In April, Labor Secretary Tom Perez told me that “long-term unemployment is what really keeps me up the most at night.” Based on May’s data, it doesn’t look like he’ll be getting a good night’s sleep anytime soon. The chart above, versions of which we’ve run before, shows the share of unemployed people finding jobs each month. (The numbers are shown as a 12-month moving average to make the trend clearer.) For those out of work for six months or less, the so-called job-finding rate has shown steady improvement in the recovery and may even have accelerated in recent months, although it remains below normal levels. The long-term unemployed, however, have seen almost no gains. Only about 11 percent of the long-term jobless find jobs each month, little better than in the depths of the recession. Moreover, even those who do find jobs are often able to find only part-time or short-term work. 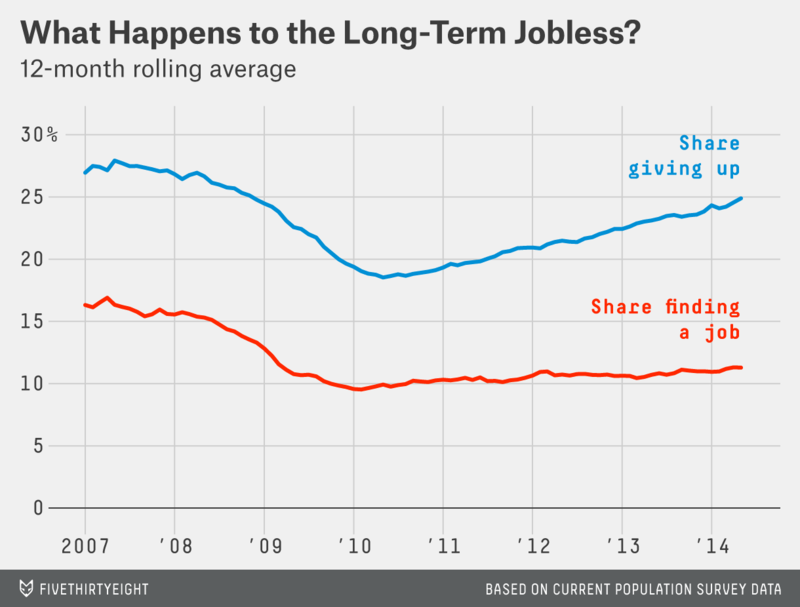 So, long-term unemployment is falling fast — but for all the wrong reasons.